Can a Felon Become a Sheriff? The biggest challenge a felon encounters after being released from prison is finding a job. Those felons who are interested in law enforcement may think about becoming a sheriff. 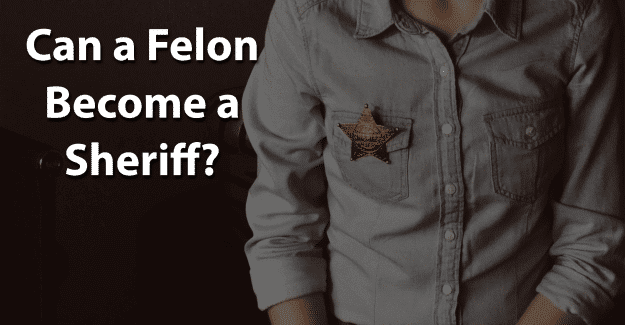 This blog post will cover the question of whether or not a felon can become a sheriff. What is Required to Become a Sheriff? A sheriff is the top law enforcement officer in a county or municipality and is in charge of creating schedules and assignments for officers in the sheriff’s department. The job is a unique position in law enforcement in that a sheriff is typically elected to the position rather than being hired or appointed. A sheriff must have extensive law-enforcement experience in supervising patrol officers and in corrections. Typically, a candidate must have several years of law-enforcement experience. Typically, a sheriff must have at least a high school diploma or a GED. In many counties, a sheriff must also have at least an associate’s degree in criminal justice or a related field. A candidate to become a sheriff must be at least 21 years old and be legally eligible to carry a firearm. In some areas, a sheriff candidate cannot be older than 35 at the time of election. Having a conviction record indicates having overcome significant challenges. Under the state election law in many states, convicted felons can vote and run for public office unless they are incarcerated or guilty of fraud-related crimes or offenses involving a breach of public trust. Many states indicate that no person convicted of embezzlement of public money, bribery, perjury, or other infamous crime shall be eligible to hold any office of trust or profit in the state. Being judged guilty of a felony will often disqualify someone from holding any office of trust such as being a sheriff. The question of whether felons can hold public office depends on the state. Some impose restrictions on those with a felony conviction and some don’t. For example, in some states felons whose conviction was older than 10 years may hold public office while in others they cannot. If they meet these criteria, they may seek to regain their rights through the process of clemency. Clemency will not establish innocence, and the record will remain. However, a felon’s rights will be restored, allowing them to hold public office. Federal elected positions are different from state offices, mainly because the U.S. Constitution takes a minimalist position, leaving many decisions up to individual states to establish. Perhaps the biggest challenge for a felon wanting to run for sheriff is the effects of the felony conviction on the public’s perception of trust. To many people, no felon is to be trusted, as all felons are dishonest. Once a felon’s civil rights have been restored, and they decide to run for sheriff, it helps to have a plan to deal with the felony conviction. It’s part of the public record and cannot be hidden. The key is in how it’s handled. It shouldn’t be hidden but neither should it be a headline. In the course of telling one’s story, it can be part of the details. It was a part of their life when they made mistakes. Then they came to a decision to live their lives differently, with public service being an essential part of it. During a campaign for a sheriff position, while the criminal record is there, it’s part of the past. It doesn’t have to define felons. When the issue is raised, it’s important to be open and honest but not be defensive or dwell on the mistakes of the past. They should put it out there for what it is, but once that is accomplished, they should leave it alone and not draw any more attention to it. Let it die out and remain focused on the election. It’s a big challenge, but it might be worth it for a felon wanting to become a sheriff. Having his or her civil rights restored through clemency and having his or her record expunged could make the essential difference in a felon succeeding in becoming a sheriff. Having their felony expunged can give them the chance needed to begin with a clean record and succeed in becoming a sheriff. Expunging a criminal record allows anyone to honestly state on an application that he or she has not been convicted of a crime. What do you think about this blog post? Have you or someone you know been in the situation of trying to become a sheriff with a felony? What was that like for him or her, and how did he or she achieve success? Please tell us in the comments below.